Want to improve your email marketing performance? How many times have we heard that something within the marketing space is dead? Print ad is dead, television ads are dead, radio ads are dead… and so on. Email marketing is one of those marketing tactics that we’ve heard is dead for many years now, yet despite this, email marketing is part of almost all brands’ marketing strategies. Well, the plain and simple reason is that email marketing isn’t in fact dead. If email marketing wouldn’t work, brands wouldn’t be using it. So what’s the reason that we time and time over hear that email marketing is dead? Most of all, the people who are saying that are the people who have been using email marketing for years, and these individuals romanticise how it used to be. If you look back at email marketing when it was just a baby and people just got their first email addresses, the open-rates were obnoxious. It’s easy to say that everything was better back in the days, and in a way, email marketing was. There’s a saying that marketers ruin everything, and while email marketing is still alive and working tremendously well, it’s undeniable that it isn’t as effective as it once was. Ever since email was just a baby, the open-rates of emails have steadily decreased over the years. This is not very strange as it runs along with the principle of supply and demand. Today, almost all brands leverage email marketing, and this means that customers are constantly bombarded with emails from brands trying to promote and sell something. As that happens, we as customers value the emails that we receive less and thus tends to leave more of the marketing emails that we receive in our inbox unopened. When something isn’t as working as effectively as it once used to, it’s easy to say that it doesn’t work. But the fact of the matter is that email marketing still, despite the decreasing open-rates proves to be effective time and time over, and this is why you still see almost all brands working to get you to sign up to their newsletter, and leverage email marketing as a central sales tool in their marketing strategy. Email marketing is the marketing where you need to worry about your craft, not the algorithm. What this means is that while the open-rates have decreased, there’s no point in romanticising how effective email marketing used to be. Instead, you need to ask yourself what you can do to improve the effectiveness of your email marketing efforts. The best part is that there are numerous strategies and tactics you can use to improve the success of your email marketing, from optimizing your headlines, to make your offers more appealing. Moreover, there are also plenty of tools and services you can take advantage of to take your marketing performance to new heights. In this post, we’re looking at 16 ways to improve your email marketing performance. To improve your email marketing performance or any marketing effort’s performance for that matter, it is crucial that you know your audience – the people you send emails to. It goes without saying, but the reason you need to know your audience is that not everyone cares about everything. I am sure you’ve received a ton of emails in your inbox which you have no idea how they got there, from brands trying to sell you screwdrivers from China to companies trying to recruit you to a Bingo society. When we receive those emails, we tend to not even open them, because they’re so irrelevant to us. And this doesn’t just go for the offer you have, but also the way you write, the way you present it, and what images you have. Everything! When you know who your audience is, you can craft messages that are relevant to your audience, and this is the first step to getting them to open your email and ultimately do what you want them to do. I’ll go more into segmentation further on, but this is the first step to a segmentation in your email list. If you are a brand selling footballs, then focus on building an email list of people who are interested in football. Moreover, if you haven’t segmented your email list, then don’t send our marketing emails that are niched. For example if you have a list of subscribers who are into football, where 50% of them are females respectively men, and you send out a marketing email saying ”50% off for women”, you’re only talking to half of the people, and therefore risk not only having your email end up in their trash, but also them unsubscribing. Also, remember that when you don’t know your audience, you’ll see out emails that are completely irrelevant to most of the people, and when you do, you’ll instead of gaining marketing benefits end up harming the relationship you have with them. Why? Because doing so sends signals that you don’t care about your audience or their specific needs. This is also why it is so important that you focus on acquiring real, interested people to your email list, and don’t buy email addresses from some sketchy service, because all you’ll do is waste your money. Everyone has different schedules and times when they open their email addresses. Obviously, people in Europe have a different schedule than people in the US, and nurses might have a different schedule than business-owners. What this means is that the time people look at their email varies a lot, and therefore, by optimising the time of which you send emails to different people, and tailor that time to when they are looking at their emails, you can significantly increase your open rates and thus the effectiveness of your marketing emails. Additionally, this can also mean that you can send your prospects and customers email when there may be less competition from other brands and this can also help improve the success of the emails you send. If you send emails to people when they aren’t even asleep, your email will only be pushed further and further down in their inbox, thus decreasing the chances of them looking at it. Now, this might sound like a lot of work, or even impossible, but the good news is that it is not if you have the right tools. If you try to look for ”the best times to send emails”, you’ll get numerous of answers, studies, and statistics that argue that they’ve found that their time is the best for sending emails, but the fact of the matter is that no individuals are alike, and so the best time to send emails for one brand might be absolutely terrible for you. So.. what should you do? Well, the best method is to simply learn through trial and error until you’ve found the ideal time, but remember, as mentioned earlier, that not everyone in your email list will have the same schedule, and this ties together with sending the right emails at the right time. And that you send the right emails at the right time is far more important than sending emails at the right time, because everyone is in different stages of your conversion funnel, and accordingly, the emails you send to them should be tailored to where int he funnel they are. For example, if you have a customer who has added a bicycle to their shopping cart, but then abandoned it, it is a terrible idea to send them an email saying ”purchase these tennis balls” rather than sending them a customised emails that will speak to them, which could be a reminder of their abandoned cart. With Sendpulse, you can use their Automation360 service to ensure that the right emails are sent at the right time. This means that you are reaching your customers with the right messages that are the most relevant to them, thus dramatically increasing the chances of conversions and that your customers actually open your emails. 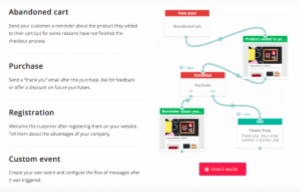 With Sendpulse, you can have automated emails sent based on your customers’ actions. These are the number of different actions that you can use to trigger emails through Sendpulse, to ensure that the right customers receive the right emails, at the right time. This is great news since, in email marketing, relevancy is everything. Lastly, Sendpulse also automatically determines the best delivery time for each subscriber, which can lead to an up to 50% increase in open rate. If you have a list of emails belonging to customers and prospects, chances are, some of those emails are completely irrelevant to your brand in one way or another. Some people might provide you with a fake email address, some might provide you with an email address they aren’t using anymore, or in any other way give you an email address which won’t benefit you when working with email marketing. When you have a bunch of irrelevant emails, they’ll have a negative effect on your email marketing performance in numerous ways, such as end up directly in their spam folder, bounce, or even worse, have you labeled as a spammer, but asking people to fill in a lot of information as well as having them confirm their email address minimises the risk of them providing you with a bad email. When working to improve your email marketing performance, this is definitely one of the most important parts considering how huge of an effect it can have on your email’s open-rate, click-through rate, and ultimately conversion rate. You probably know the power of personalization in marketing, and the fact is that personalization in email marketing is no different. Every day, we’re bombarded with marketing emails in our inbox, and this leads us to not opening the majority of them. To have people open your email and carefully consuming it, you need to take new measures, and one of them is personalization. In fact, studies have found that just including the name of the recipient in the subject line can increase open rates by 50% and lead to 58% higher click-to-open rates. a press release. Despite the fact that personalized subject lines have proven to be so incredibly effective for increasing open-and click-through rates, 97.7% of emails sent in Q2 didn’t use personalization in the subject lines. As a marketer, you can realize just how much you’re leaving on the table if you’re neglecting to do something as simple as personalizing your email with the name of the recipient. The most common reason that brands aren’t using personalization is that they don’t know how to do it. Obviously, you can’t send emails by hand one-by-one and manually type in the names of each recipient because doing so would be extremely time-consuming, but the good news is that with email services, sending personalized emails is as easy as 123. With Sendpulse, you can effortlessly personalize your emails, and apart from just addressing the recipient by name, insert any other information you have about them into your emails to make your email even more tailored to the person receiving it. With the email service, you can use an unlimited number of fields to include different kinds of details about your prospects and customers, both in the email subject line as well as any part of the e-mail body. By simply adding their name, you significantly increase the chances of them opening your email and start reading. Once that is done, it is your job to have an appealing and engaging email which engaged them to continue reading and ultimately get impacted by your message. As already emphasized, when working to improve your email marketing performance, personalisation is everything. But the thing is that there are many more benefits to it than just increasing your open-rate. By using personalisation, you win customer loyalty since it sends signals that you value you customers, and talk to them as a person rather than just a customer. Moreover, a huge benefit is that it also increases the percentage of e-mails that get through spam filters. Today, we live in a society where we are bombarded with information and people trying to get our attention. From when we open our email, to when we go to social media, or watching television. As a result of the huge information overload that is available, the human attention span has decreased, and now, it only takes us a few seconds at maximum for us to decide whether or not we’re going to continue consuming it, or continue with our day. As a brand working with email marking, you only have one end goal- always, and that is to ultimately sell. While it might not be to sell immediately, the end goal is always sales. At the birth of email marketing, the few brands leveraging it would send marketing emails that contained endless amounts of texts, and what’s even more crazy is that people would actually consume it, just like they would carefully consume each and every email they received. In other words, back in the days, it worked. But today, if you’re going to improve your email marketing performance, you need to keep it short and concise, because otherwise, people will just click away when they see how much work it is to read your email. When sending emails, you need to ensure that people can quickly extract the key points, and then decide whether or not they want to proceed with what you want them to do. Furthermore, you should not only keep your email short and to the point, but you should also make sure that you only have one place which people have to focus on. If you have endless of different boxes where people should read, people will have no idea where to start, thus often leading to them clicking away. You don’t need to have page long texts n your email, and shouldn’t either. Focus on quickly getting your point across, because if people are engaged in your email, they can easily just click through to your website to learn more. Also, have in mind that the majority of emails are read on mobile devices. If your email is long, people will have to scroll and scroll, and for the few that actually take the time to consume it all, minutes later, they won’t even remember what they just read. When using a mobile, just a few lines of text looks overwhelming, so make sure you aren’t writing emails that are intimidating and overwhelming from the second people open it. An important reason why brands are struggling with writing great emails and creating a structure which gets their emails read is the they don’t know what formats are true and tested, and what email formats are working. Luckily, Sendpulse offers an easy-to-use email editor which allows you to drag and drop objects into an email editor which demands no HTML knowledge to create an engaging email format. When creating your email, you’ll have various proven formats to begin with, which ensures that you can easily and effectively get your point across. The attention span of humans are incredibly short. In fact, it was found in a study that the attention span of humans are shorter than that of goldfish. This, as mentioned, puts a great importance on keeping your emails short and consice, but that’s not all. To improve your email marketing performance, you don’t only want to keep it short and concise, but you also want to make your email easy to read. And don’t for one second think that just becuse your email is short that it is easy to read. Obviously, getting people to open your email is a super important part of a successful email marketing campaign, but if people are just opening your email and then not reading, you’ll have no opportunity to impact your audience or get them to take action. In other words, your email will be pointless. This is why, equal to how creating emails that gets opened is important, creating emails that are actually getting read is even more important. Sure, writing convincing copy is important, but making sure your emails are easy to read is everything. If the recipient has to squint or strain their eyes in order to be able to see the content in your email, you’ve lost. Therefore, focus on putting user experience at the forefront of your emails. Make them easy to consume without much effort, on a desktop, as well as mobile. Use large fonts that can be easily read, and use a mixture of visuals and text to break up the content and encourage the user to continue reading. Also, make sure that the text is well-contrasted to the background. Chances are, you’ve opened an email where you have to zoom and squint your eye just to read it, and if you’ve done so, you can agree on the fact that it isn’t a pleasant user experience and an experience that is likely to make people click backspace. With the Sendpulse email editor, you can start with their email templates which ensure an appealing distribution of your content, and then take it from there. A simple and easy trick, but a trick that actually works surprisingly well. In this day and age, emojis are everywhere. They help give context to what we’re writing, and at the same time, they’re fun and engaging. Emojis help bring some colors to the conversations we have and the way we communicate, and equally so, they can be used to improve your email marketing performance. More and more, emojis are being used in emails, and the best part is that using them in your email subject line allows your email to stand out from the crowd, add some color to it, and ultimately make it more engaging to click on your email. In the inboxes your email ends up, there are endless of emails surrounding it, and this puts a great importance on crafting emails that stand out from the crowd. Using emojis in the subject line is one of few ways in which you can do that. You know that in order to improve your email marketing performance, it is crucial that you know your audience, but how can you not only get to know your audience but also divide different people of your email list into different categories and then send different emails to them which speaks to each of the different individuals in a better way? The answer lies in segmentation. Segmenting your audience (the people in your email list) most importantly means that you’ll be able to increase your click-through rates and click-through rates, but segmenting also comes with a number of other benefits. The main reason you should work with segmentation is that it allows you to reach the right people with the right message. When the messages are more relevant to the recipient, they’ll also be more engaged to open and consume it. No person is the same, but people can still have the same interests and same characteristics, and this also goes for the people on your email list. So by segmenting these people, you can provide them with relevant emails and different types of offers which speak to them the most. In short, segmenting is about creating relevant emails and giving your subscribers what they want. And you do this by segmenting your email subscribers based on a number of factors. Segmenting based on gender can be helpful when sending emails such as ”happy father’s day” or international women’s day. Segmenting on countries is effective for example to create a more tailored email to people in a specific country to make them feel more exclusive and make them relate better to the email. Furthermore, country segmentation can also be used for changes in the content of emails depending on the place of residence of the customer. Lastly, the subscription date can be used to send out emails to people who have been subscribed for more a month/week/year etc, as well as to send reminder emails to people who have registered but not bought anything. Now, I know it can be hard to trust the words of a stranger on the internet, so therefore, I’ll let the statistics talk to prove the power of segmentation. 24% have improved the deliverability and overall profit. The best part is that while segmentation sounds complicated, it’s really not. At least if you’re taking help from tools. In this 1 and a half minute video, you’ll learn how you can easily segment your email subscribers with Sendpulse to improve your email marketing performance. Your email will be opened on both mobile and desktop, and it will also be opened on screens of all sizes and shapes. While this wasn’t the case back in the days, the majority of emails will also be opened on a mobile device. In fact, about 55 percent of emails are opened on mobile devices—up from just 29 percent in 2012. This means that you need to create responsive emails that look equally well on an iPad as it does on a desktop. You’ve probably opened a non-responsive email in your life where the text was completely messed up and all over the place, and the images were everywhere. If this happens, you’ll instantly just click away. This means that if you’re aren’t sending responsive emails, you’re missing out on tremendous opportunities. But how do you send responsive emails? Well, the best and most surefire way is to use an email service which takes care of all of that for you. Sendpulse’s email templates are all responsive, which means that they’ll deliver your emails perfectly across all devices and screen sizes. When working to improve your email marketing performance, you’d be surprised at how much of a difference having a clear call-to-action can do for your email click-through rate and conversions. Every email you send should include a Call-to-Action, but do all of the marketing emails have one? But the thing is that when creating CTAs, it’s simply not enough to just create any CTA and hope that it drives results. Instead, you need o put great emphasis on the CTAs you create so that they compel readers to take action immediately, and this is a really hard thing to do. An effective CTA includes 2-5 words. In other words, it should be clear and concise. Make sure you stick to only one CTA, however, because if you have too many, you risk confusing the user and making them less likely to any of them. The only way to improve is to know what to improve. And the only way to be able to improve your email marketing performance is to know what you can do to improve it. To know what you need to improve, you obviously need to measure and evaluate results. In marketing, you want to evaluate all marketing efforts you do, and you want to do this for a number of reasons. Obviously, if you don’t know how well you’re performing and what isn’t working well, it will be impossible to improve. At the same time, measuring results allow you to know what is working. It allows you to test, experiment and try, in order to find what is working the best. Through A/B testing followed up by results measuring, you can constantly make small tweaks and changes which ultimately helps you send emails with the highest open-rate, highest-click-through rate, and an overall huge success-rate. In other words, emails that give you the most bang for your efforts. So how do you measure the success of email marketing? Well, back in the days, seeing if people actually opened your email was quite tricky. How would you possibly know if someone opened your email, right? Through custom discount codes? By asking them? Fortunately, we’ve come a long way since then, and now, there are plenty of email services that give you rich data on how you emails perform. 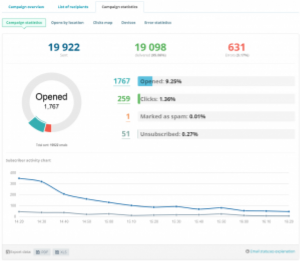 Sendpulse’s statistics provide information on opens and clicks so you can monitor the results and improve your email campaigns. The analytics don’t just tell you how many people have opened your email, but it also shows you open by location, a clicks map, the devices used to open your emails, error statistics, domains, and maybe best of all, SendPulse supports Google Analytics which you to track the website visitors (their location and actions at the site) and the results of your marketing campaign. One of the ways to improve your email marketing performance is to resend emails that haven’t been opened. With the help of statistics from Sendpulse, as talked about earlier, you’ll know how many people have opened, and most importantly, not opened your email. The reasons that people don’t open emails are many. Mainly, it is because they just didn’t find it interesting based on its headline, but many times, it can be because they just missed your email and that it got lost in the large seas of emails they receive every hour. To truly succeed, and this goes for everything, you need to be persistent and try over and over. A study found that you can increase your email reach by 54.7 percent by resending the exact same email to recipients who had not yet opened his original message. THat’s quite powerful. Furthermore, the study tried emailing the recipients who hadn’t yet opened one week later, increasing the open-rate by another 30 percent. It’s not very surprising that sending the same email to the people who haven’t yet opened it will increase its open rate since it gives the email further exposure without you having to create a completely new email. The advantage of resending unopened emails to your subscribers is that it gives you the opportunity to change the subject line and the time of sending. This will create the impression that your email is a completely new one, while, in fact, people who haven’t opened it just won’t know that it is an old one. The feature to effortlessly send emails to people who haven’t yet opened them is available in SendPulse free plan account. Every day, more than 100 billion emails are flagged as spam. For marketers, this is a huge loss, because it means reaching fewer people and thus limiting the chances of gaining marketing benefits from email marketing. The vast majority of people never look at their spam inbox, but if they do, they very seldom look at marketing emails that have been sent to them, because they assume, that because the email has flagged it as spam, it’s not something worth spending time on. To improve your email marketing performance, you need to create a sense of urgency. Humans have, at a smaller or greater degree have FOMO – fear of missing out. This is why you see so many marketers and brands leveraging the human psychology and create this sense of urgency, and this is something you want to do too in order to get people to take action. If you have an offer which you present to your audience, don’t just present them the offer, but let them know how much time it is left, and that there are only a few products remaining. Since humans don’t want to miss out, they’ll be more likely to act quickly without thinking twice. You’re probably no stranger to the fact that humans are visual creatures. Research has found that emails with video content have a 40% higher open rate. That’s quite a significant increase. Furthermore, in an experiment with videos in emails, a brand experienced a 28 percent increase in click-throughs. 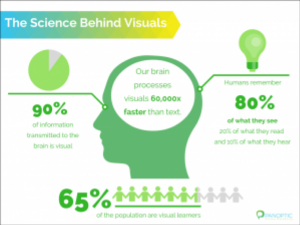 While these statistics are impressive, they don’t come as a huge surprise when you remember that we are visual creatures, and will, therefore, be more impacted by messages that are conveyed by videos rather than text, and at the same time, find videos more engaging than text. By including videos, you’ll not only be able to increase the number of people who open your emails, but you’ll also be able to get people engaged and to consume the message you’re trying to convey, and thus impact them on a much deeper level. How do you incorporate videos into your marketing emails? Write the text of the link in the template. Click on the text with the write right mouse button. Choose the “insert a link” option in the menu. Fill in the necessary information and the link in the opened form. Insert the snapshot into the email template. Сlick on it with the right mouse button. Fill in the link in the opened window. The most fundamental part to improve your email marketing performance is to optimize and improve your subject lines. Obviously, if people aren’t opening your emails, it doesn’t matter what message you have in your email, or how good of a deal you offer your audience. No-one will even know about it. A study found that 35% of email recipients open emails based on the subject line alone. This means that it is absolutely crucial that you come up with unique subject lines which grabs people’s attention and which they actually want to click. Firstly, it is important that your subject lines clearly convey what value it provides the recipient. Furthermore, it is also a good idea to convey a sense of urgency or even mystery. You yourself have probably received emails with a subject line that was so appealing and intriguing that you just couldn’t help but click to find out more. This is what you want your email subject lines to do each and every time. The rules of writing email subject lines to improve your email marketing performance are quite vague, but there are a number of things you need to have in mind when writing your subject lines. Firstly, you need to keep your subject line five words or less. This has proven to be the ideal length, as it both helps your email stand out from the crowd, but also be a length which people will actually read. The absolute best way to increase your open rates through your subject lines is to experiment and test, so you can find out what your customers respond the best to. Also, have in mind that words such as “donate,” has been found to reduce email open rate by 50 percent or more. To take your email marketing to new heights, you should also give Sendpulse a shot as their tool helps you streamline your process, while, at the same time, ensuring improved results. Their free plan is a great start.